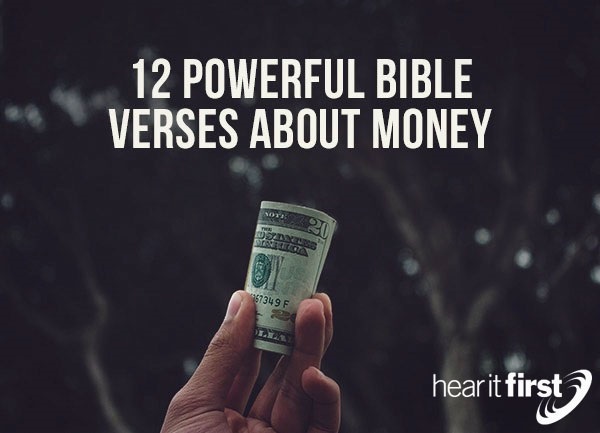 Here are 12 powerful Bible verses about money. Most Bible translations describe us as servants of God, but in reality, the Greek word used for servant in the New Testament is “doulos” which means, slave and not a servant. There’s a huge difference between a slave and a servant. A servant gets paid and can go home. The servant owns nothing and stays with the family…but then, over time, they become part of the family. Only when Jesus speaks of Himself as being a servant it is the actually word, “servant” used, but for the Christ-follower, we are much more than servants; we are His slaves, and as slaves, all that we own is His, so obviously we can’t serve money and serve God. We are property of the Master, having been purchased by the very blood of Jesus Christ (1st Cor 6:20). I see that the author of Hebrews links a love of money with discontentment as he says that we’re to keep our lives free from the love of money and just “be content with what you have,” meaning that if we keep our lives away from the evil of loving money, we’ll be more content. Besides, God has promised He will never leave us or forsake us, so even if our money forsakes us, God never will. You can’t take it with you, but you can forward it ahead, so if we lay up treasures here on earth, what good is it? It’s all going to be burned up anyway as the Apostle Peter writes, “the day of the Lord will come like a thief, and then the heavens will pass away with a roar, and the heavenly bodies will be burned up and dissolved, and the earth and the works that are done on it will be exposed” (2nd Pet 3:10). If you sow your treasures into the things of God, you are storing up treasures in heaven. Just take a look at your checkbook ledger or bank statement; it really reveals where your heart is at. The reason God reminded the nation of Israel that it is He that gives wealth, was so that they (and we) might not “say in your heart, 'My power and the strength of my hand made me this wealth’” (Duet 8:17). Of course, if we take credit for blessings, that robs God of glory. Paul humbles us by asking, “What do you have that you did not receive? If then you received it, why do you boast as if you did not receive it” (1st Cor 4:7)? I ask myself, “What do I have that I did not receive?” I came up with zero! Very similar to Deuteronomy 8:18 is this verse that ascribed to the Lord the ability to make rich but also to make poor. Let none of us boast because He can bring low anyone to humble them or exalt anyone that’s humble. That is His prerogative. If you humble yourself voluntarily, then God won’t have to do it for you. The New Testament has almost 365 references about not worrying, not being anxious, or not fearing. That gives us about one verse for every day of the year, and we probably need it because of our tendency is to be anxious over just about everything. I speak from experience. I still think like the “Gentiles” think who worry “after all these things.” Sadly, I forget that my heavenly Father knows what I need before I even know it. I pray that I remember to seek the kingdom first, and that means seeking the King of that kingdom. Whoever is in debt understands this verse very well. You don’t need to be a Bible scholar to know that the rich rule over the poor. Most of us have at least some debt and we know what it feels like to be “the slave of the lender,” at least until we pay off the debt. It’s like a man who came in the middle of the night knocking on his neighbor’s door and asking for some help because he couldn’t get his car started and needed a jump start. The man didn’t answer the door, having looked out the window and seeing his neighbor’s car hood open. For him to turn someone away was sin, even if it was only using his time to help his neighbor, because “whoever knows the right thing to do and fails to do it, for him it is sin” (James 4:17). God will reward those in the kingdom who have been faithful with very little, but if we’re not faithful even in the little things, God’s not going to put us in a place where we’ll have a lot of responsibility. That’s because we haven’t proven faithful in the smallest of things. Those “little things” might be giving someone some financial help, offering to give someone a ride to work, helping clean the church bathrooms, or just whatever else comes to mind. A person can own a lot of possessions, but then the danger is, the possessions come to own them. Like the young rich ruler who went away sad because he had much wealth, and he worshiped it, and not really worshiped God like he boasted. I believe you cannot out-give God. Solomon’s reminder is so important, that “Whoever is generous to the poor lends to the LORD, and he will repay him for his deed” (Prov 19:17).